Do you get stressed out when hearing the phrases ‘progress monitoring, tracking progress, or assessment tracking’? Don’t worry, help is STILL on the way…yes, this is the second in a series of posts related to the Marzano Teacher Evaluation platform and the iObservation teacher evaluation system. This blog-post series will help you seamlessly navigate through the most important domains of the Marzano framework and support a growth mindset with ease! If your district uses the Marzano evaluation system, there are several ways in which you can easily keep up with progress monitoring. Let’s walk through the use of student portfolios and assessment tracking—in ways that are both teacher and student-friendly. Yep, finding a beneficial, simple-to-use way to carry out assessment tracking may be easier than you think. Finding the TIME in your hectic schedule may end up being the hard part. 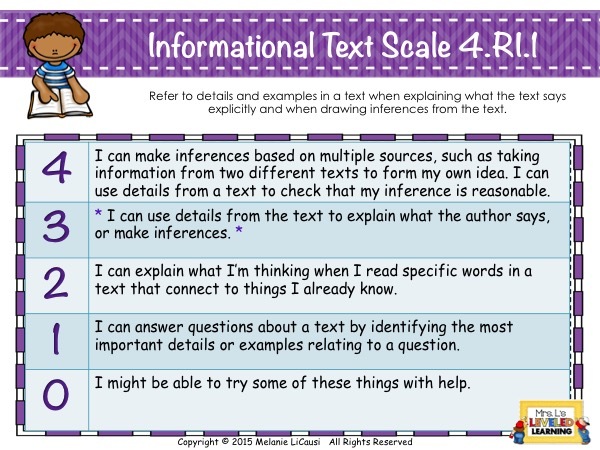 As we discussed in the previous post, using scales and rubrics are one way that make it easier for teachers to keep up with student learning. Scales & rubrics vastly decrease the ‘paper grading load’ for teachers, while at the same time, they allow students to see for themselves what they know, and what they need to focus on more, with regard to their learning goals. 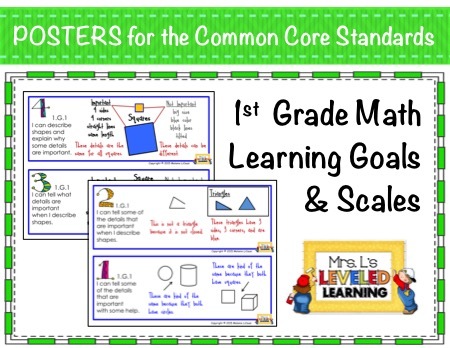 While making those learning scales and rubrics adds a bit more planning time before starting a unit, the time making them certainly pays off exponentially as the unit progresses and comes to a close. Here’s an example from 4th Grade ELA. One of the benefits of having a progress tracking system is that students can evaluate themselves. When students are informed of their status on a regular basis, they are more apt to take ownership of accomplishing their learning goals. This sense of ownership also helps them to stay in a growth mindset and not get discouraged when they aren’t progressing as quickly as they’d like. Monitoring progress can take the form of a formal assessment or grading on the fly! Classroom games, observation of hands raised for understanding, clicker systems, and informal questioning are also valid ways to track student progress—with out dumping even more papers to grade on the teacher. Having ‘in-class lessons’ that teach your students how to interpret the student data that’s found on your school (or district) website is also a way for students and teachers to save time evaluating a students’ learning progress. In this type of lesson, students will have the chance to ask questions and get detailed explanations from the teacher (and their peers) in a comfortable setting. Often times, it seems that if you’re individually explaining online data to students, they will pretend to understand what you’re showing them, which doesn’t serve them or you. Creating a fun and engaging lesson on understanding their data, one in which lots of questions are encouraged, is key to helping students understand their progress. Here’s an example of the assessments I use to help students objectively SEE their progress. 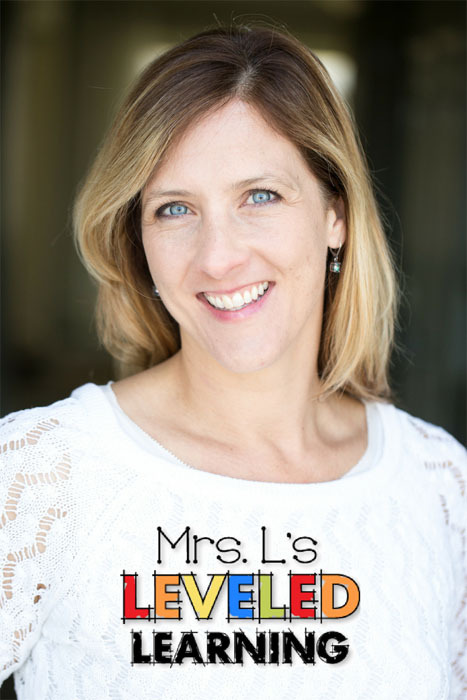 A leveled assessment gives them a way to prove mastery at multiple levels. I use these for pretests and posttests. Printing their info and having one day a month set aside for regular, friendly (& brief) Data Chats is a great option to boost a student’s growth mindset while informing them about their status. It’s also a wonderful chance to privately offer positive feedback, helpful strategies for doing better, and encouragement to students who need it. These data chats also empower students who’ve progressed at a faster rate, the chance to discuss options for independent exploration of a related topic that may interest them, which is also a fabulous way to differentiate the learning in your classroom too! 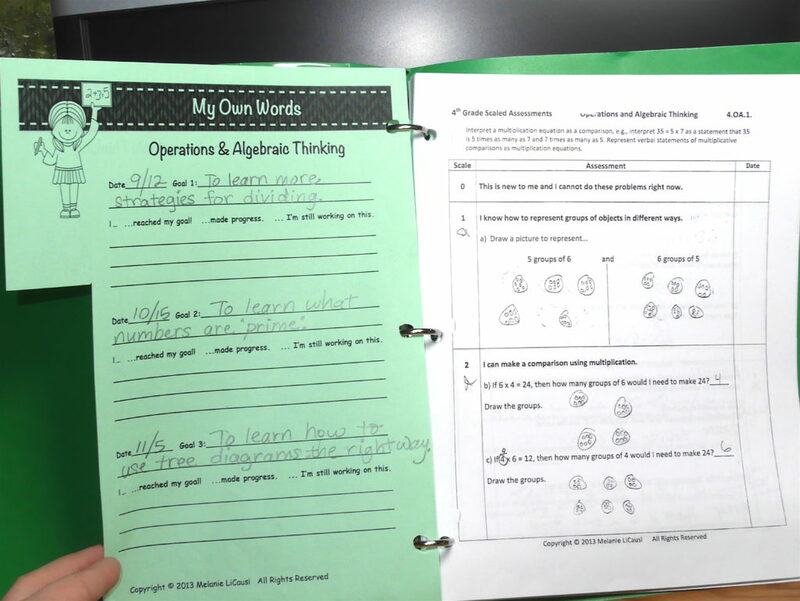 Student Portfolios are another extremely teacher-friendly way to monitor student progress! If you’ve never set up student portfolios, don’t worry—students love them and they are a terrific time-saver for you! 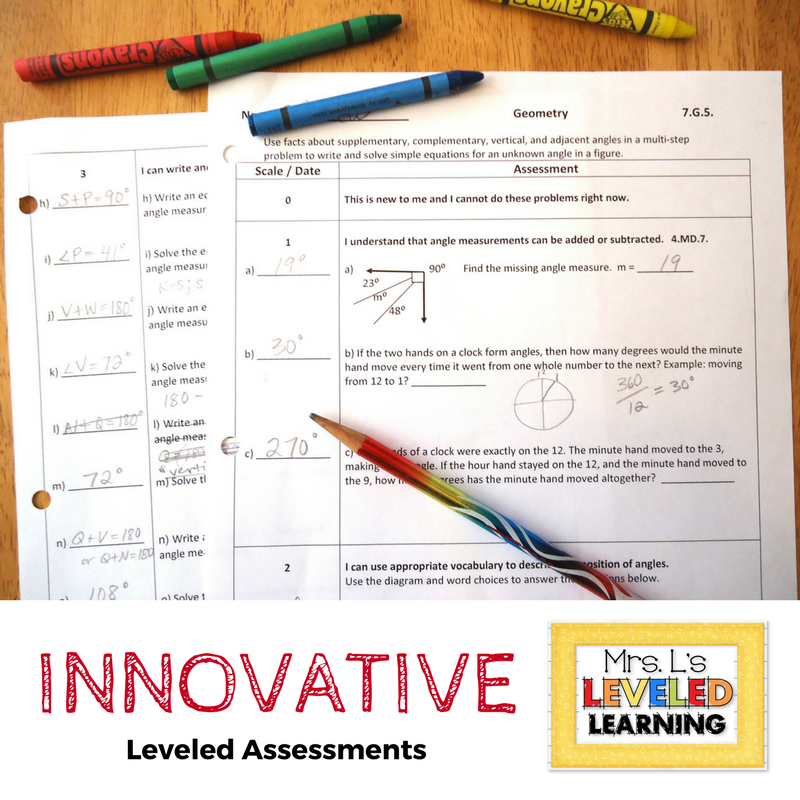 They can be as simple or as complex as you make them, but generally speaking, they are a place to keep a student’s assessments, in a way that allows students to update them and see their progress. 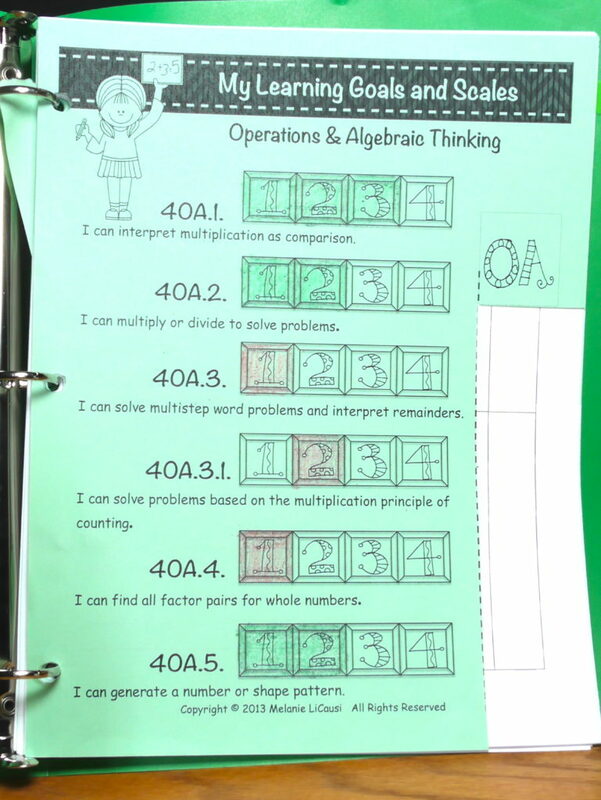 Once they are set up, students seem to really enjoy maintaining them, but they’re also an awesome tool for teachers and parents to evaluate a student’s progress! Flip through my Student Portfolio on Youtube! 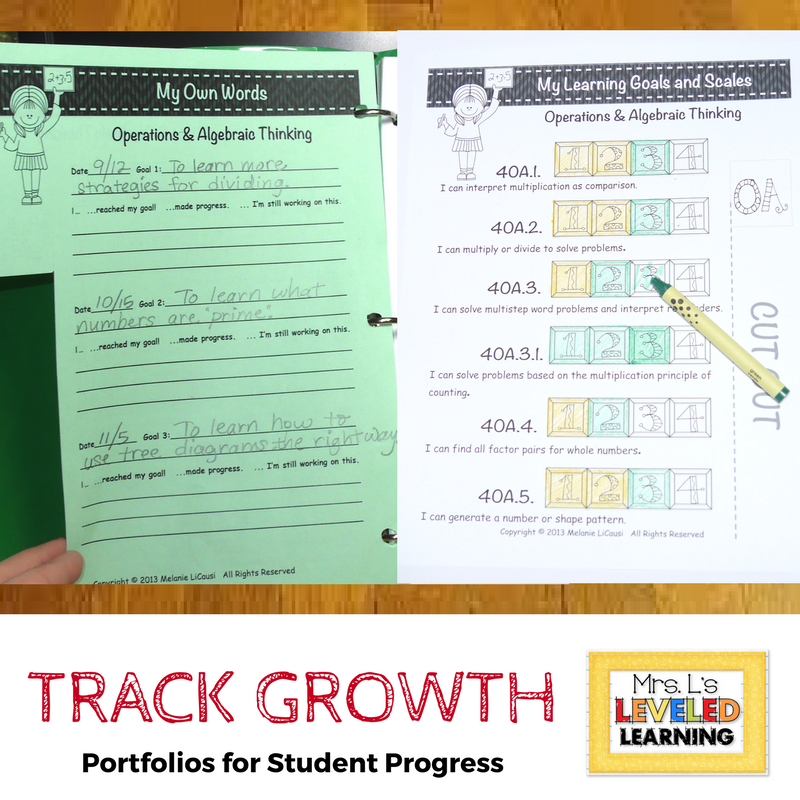 I developed this to track growth using Learning Goals and Scales or Standards Based Grading. Each tracking sheet is a binder divider with room for reflections on the back side. The binder is full of student work (projects, tests, classwork, etc), specifically selected to show mastery of content standards. It made conferences and Teacher evaluations so much easier! Using this type of assessment tracking , assessments and coordinating scales, with a combination of any of the others that have been discussed will truly help you shine when it comes to documenting student progress as part of your own Teacher Evaluation. It’s simple really, just as the Marzano evaluation platform provides specific feedback for teachers in helping them toward the goal of being a better educator, tracking student progress helps students to reach their learning goals as well! Don’t forget to stop by and check out the next post on Celebrating Student Success. What are some ways that you track and monitor student progress? Feel free to share your thoughts in the comments below!